This is the first post in a bit for me, lots to do and not enough time to get things done, just like the majority of folks out there I assume.. :) This pendant I have been working at on and for some time. The lion is painted in acrylics on a flattish stone.. I did this way back in 2003, had it on a necklace with a glued bail and one day I noticed the bail was loose. So I carefully pried it off and then kept looking at the loose stone for months.. started a Toodles wire weave wrap on it and made some mistakes in measurement so had to start it over again not once but twice! Everyone I am sure has heard The Lion, King of the Jungle! well lions are really animals of the savannas.. preferring flat grasslands to jungles in most cases... but the term has been so ingrained that I thought a good way to display Leo was to have him peeking through some foliage ... A friend of mine saw this yesterday and did get the concept,,, "Oh it's like he is coming through jungle vines!" YES!!!!! I did manage to convey my concept... HURRAH!!! Whew! 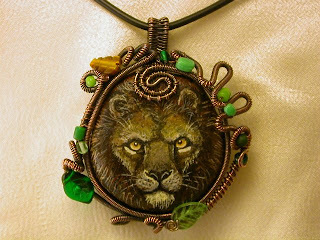 Your jewelry is lovely...but if you can paint a lion like this, I hope you will keep painting!! He is very well done!